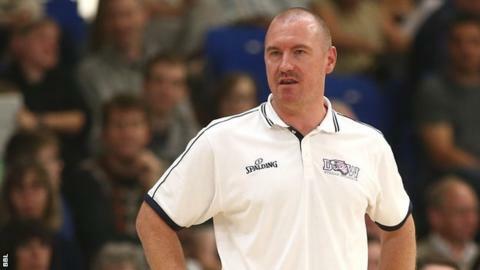 Durham Wildcats coach Lee Davie wants his side to build on their dramatic 70-67 victory against Manchester Giants in the BBL Championship on Sunday. Ralph Bucci's late three-pointer settled a pulsating game, ending Durham's three-match losing run. "Those games are why you put all the time and effort into preparation for games. I would love to play 36 games a year like this," said Davie. Elsewhere, leaders Newcastle Eagles beat Glasgow Rocks 103-93. Durham and Manchester finished with identical records last year as both reached the BBL play-offs, and Sunday's win took Davie's side into the top eight. "This is a huge win for us, it's snapped a three-game losing streak, we're 1-1 in our best-of-three series with Manchester for the head-to-head, we closed out a fourth-quarter with a win and we did all of this short-handed," continued Davie. "Moving forward, we need to build upon this result with this weekend's games against Leeds and London." It was the Manchester club's second loss of the weekend, having fallen 90-81 to Worcester Wolves on Friday. Wolves followed that success with a 78-62 defeat of Surrey United on Saturday, while Bristol Flyers lost to Cheshire Phoenix 86-73. Flyers had beaten Leeds Force 73-58 on Friday and Leeds also lost out to London Lions 78-70 on Sunday. There were two other dramatic finishes on Sunday, as Tyler Bernardini inspired Leicester Riders to a narrow win at Rocks, while Cheshire held off Plymouth Raiders 104-98. In the WBBL, 16-year-old prospect Abigail Lowe demonstrated her potential with 12 points in Barking Abbey Crusaders' 67-56 victory against Cardiff Met Archers. Both teams had already advanced to the National Cup semi-finals, joined by Brixton Topcats and Sevenoaks Suns.